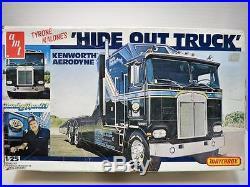 Tyrone Malone's Kenworth Aerodyne "Hide Out Truck" AMT 1/25 Kit 5008. Kit number AMT 5008/Matchbox PK-8405 features: Tyrone Malone raised letter tires, full Bandag Race Team decals, (chrome grill, bumper and stacks), and drive on ramps. Kit is molded in white and tan plastic, with many parts still on trees. Note: parts packaged in bags for convenience and extra packing. Sorry box has been repaired as best possible. Show off your items with Auctiva's Listing Templates. The item "Tyrone Malone's Kenworth Aerodyne Hide Out Truck AMT 1/25 Kit 5008" is in sale since Wednesday, March 02, 2016. This item is in the category "Toys & Hobbies\Models & Kits\Automotive\Truck". The seller is "mummymia" and is located in Wrentham, Massachusetts. This item can be shipped worldwide.